In 1917 Henry Cubitt (now 2nd Lord Ashcombe after his father’s death) petitioned the Bishop of Winchester to convert the south transept of St Barnabas Church into a chapel in memory of his eldest son Henry Archibald Cubitt who had died in action in France the previous year. 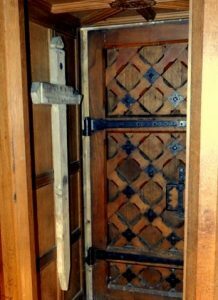 Windows were removed, an altar recess formed in the east wall, a new doorway cut through the south wall, and an entrance made from the nave through a gate of scrolled iron surrounded by a carved oak screen, all of which resulted in the Chapel as we know it today. The poignant ambience of the Chapel, and the deaths so close to each other of the three sons of the Great House, never fail to awe the first-time visitor. Apart from this, the exquisite mural by E. Reginald Frampton is probably its most notable feature. Edward Reginald Frampton (1870–1923) was an English painter who specialized in murals, often war memorials at churches. His work usually depicted symbolic subjects and landscapes. He is known as “the last of the Pre-Raphaelites” and was influenced by Burne Jones. Frampton’s mural in the Cubitt Chapel at St Barnabas surrounds an “Adoration of the Magi” in pastel shades above the altar. Painted directly onto the wall instead of the more usual plaster, above the painting are nine figures standing on the arc of a rainbow (symbol of hope). The central three are angels (one holding a Star of Bethlehem); the other six figures, from left to right, represent Justice, Fortitude, Peace, Faith, Hope and Love (Charity). 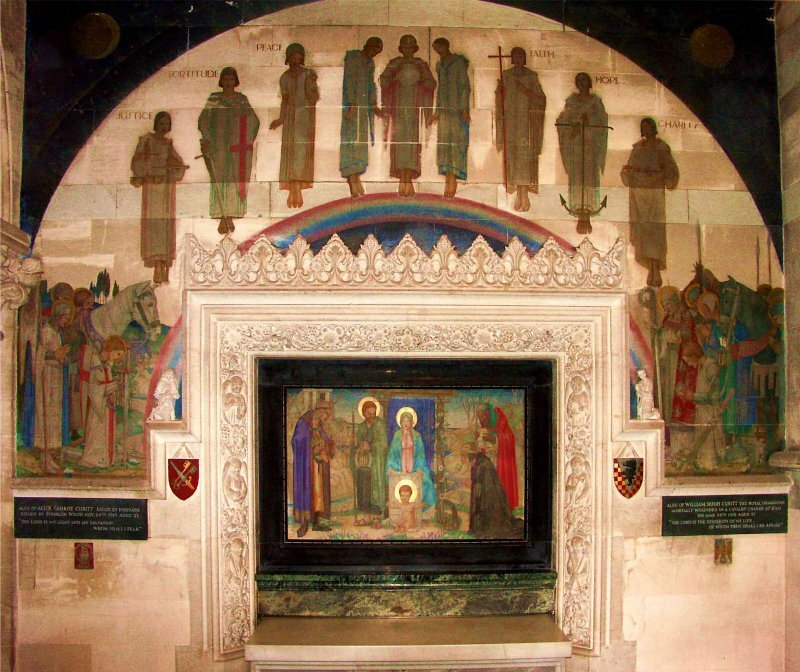 Below them, on either side of the reredos, are the patron saints of the allied nations, with other warrior saints to commemorate the fallen sons as soldier saints. On the left hand are St Joan of Arc, St George of England (kneeling by his horse), with St Eustace (a legendary soldier saint from Ancient Rome) and St Aidan of Lindisfarne. On the right, St Galahad also kneels by his horse, with St Denis of France, St Martin (who gave half his cloak to a beggar), St Gudule of Belgium (popular as a patron of hunting in the Middle Ages) and St Alban (the first martyred saint in Britain). The Adoration of the Magi is surrounded by elaborately carved beerstone, with vines and grapes on the upper part. Below, on each side three cherubic angels, carved vertically, hold symbols of the Crucifixion. The topmost angel on the north (lefthand) side bears a cross, the second a cup, and the third scourges. On the south the first angel bears a crown of thorns, the second a hammer and nails, and the third a spear and sponge. 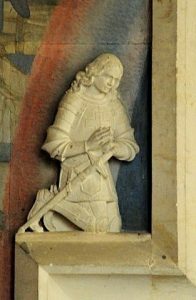 On either side of the reredos are carved two small kneeling figures: a mediaeval knight and a soldier of the Great War. The carved shield to the left has two keys and a sword (the arms of Winchester Diocese, in which St Barnabas was situated until 1927); the carved shield to the right, a red and gold chequered field and a black lion on a silver triangle, is part of the Cubitt arms. 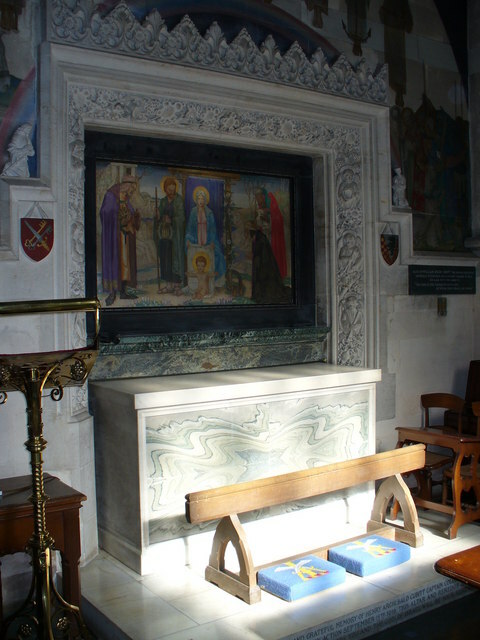 THIS ALTAR AND REREDOS ARE ERECTED BY HIS PARENTS. KILLED IN BOURLON WOOD NOV. 24th 1917 AGED 23. 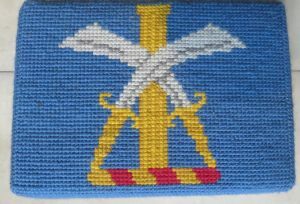 Part of Hugh’s regimental badge is one of Napoleon’s eagles because, at the Battle of Waterloo in 1815, Captain A.K.Clark of the 1st Royal Dragoons captured the Eagle standard of the French 105th Infantry Regiment, so it became the Dragoons’ badge. 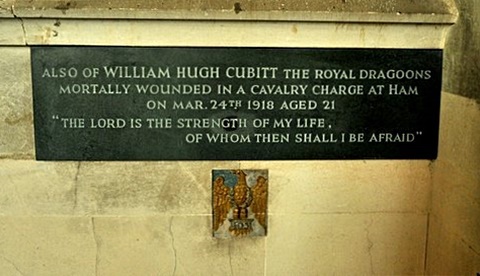 The Bible quotation on Hugh’s plaque is the second half of Verse 1, Psalm 27; the first half is inscribed on the adjacent plaque commemorating his older brother Alick George. To the left of the door covered with leather, which leads from the Chapel towards the churchyard, is Harry’s original grave marker. 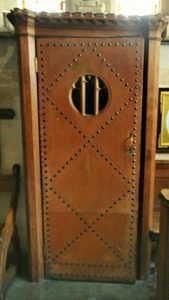 Between that inner door and the outer one there is a second, larger wooden cross, an intermediate memorial before replaced by the familiar narrow headstone used for many of the dead on the battlefield cemeteries. 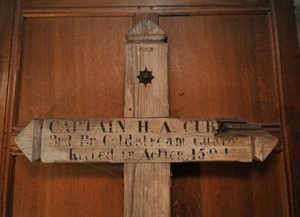 Although the government had decided not to repatriate any of the bodies of the fallen, such crosses were often returned to home parishes and reverently displayed in local churches. Even more impact to the poignancy of the Chapel is given by the hand-tinted portraits of the three dead brothers which now hang there. These photographs were recently discovered in an attic where they had been stored after the death in 1972 of a surviving brother, Archibald Edward Cubitt. The Cubitt family decided the Chapel would be an appropriate place in which to keep them. 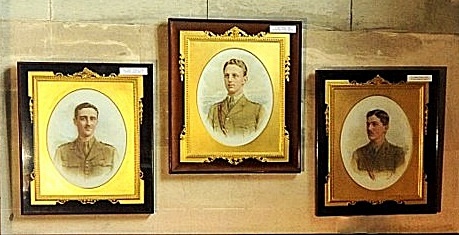 The brothers were photographed by the society photographer Vandyk, possibly as each was commissioned to his regiment. At the annual Remembrance service in November a small silver cross and candlesticks are placed on the altar of the Chapel. 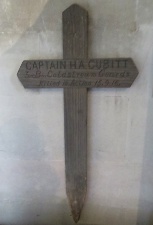 The names “Harry, Alick and Hugh” are inscribed on the branches of the cross; the inscription around the base reads: “from Pearl, Rolie, Archie and Guy”. 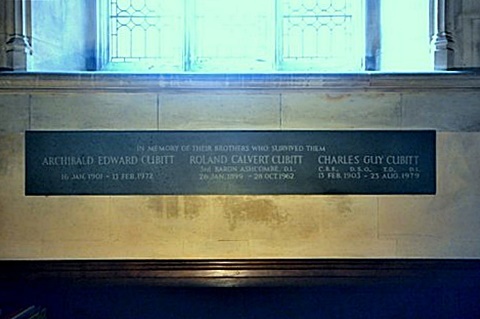 The last three names are, of course, those of the three surviving brothers (to whom a memorial plaque can been seen on the west wall of the Chapel). Pearl Barrington-Crake was Harry’s unofficial fiancee. She later became Lady Montagu of Beaulieu; then, widowed, she married Captain the Hon. Edward Pleydell-Bouverie, MVO, RN. 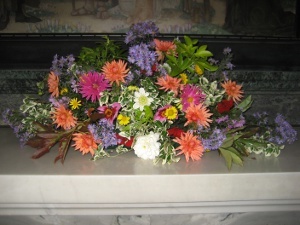 The altar in the Cubitt Chapel is decorated at other times of the year with flowers arranged by a member of the Cubitt family. 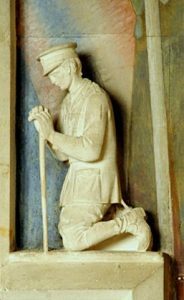 Commemorating the Fallen – The Lord Lieutenant’s Soldier Sons in the First World War and the Making of the Memorial Chapel at St Barnabas Church, Ranmore” by Professor Keith Grieves of Kingston University. A scholarly, fascinating and extremely well documented article from “Surrey History” (Journal of the Surrey Local History Council, 2000). and reproduced as a pamphlet for the Ranmore Archive. 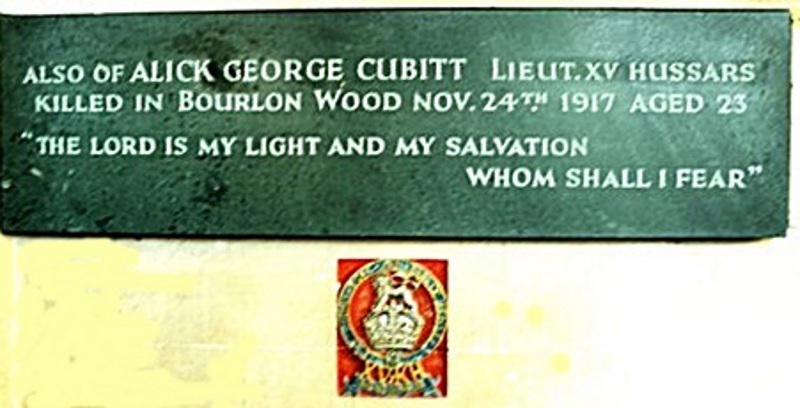 Those interested in reading more about the Cubitt Chapel, as well as the three Cubitt casualties on the War Memorial, are advised to read Professor Grieves’ invaluable account, which includes an immensely detailed list of his sources.